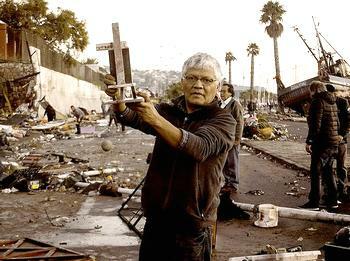 SANTIAGO, Chile, September 18, 2015 (ENS) – Thirteen people died and about one million others were forced to flee their homes after a magnitude 8.3 earthquake struck off Chile’s central coast Wednesday night. But wise investments in emergency preparedness saved lives and property, officials said. The quake occurred 46 kilometers (29 miles) offshore from the city of Illapel on September 16 at 19:54 local time. The shaking lasted three minutes, a time that seemed like eternity to coastal residents. Chilean authorities ordered the immediate evacuation of coastal areas due to tsunami risk, with many coastal residents receiving automatic notices by cellphone right after the quake. Tsunami watches, warnings, and advisories were issued for Ecuador, Peru, New Zealand, Fiji, the Solomon Islands, Hawaii, California and Japan. 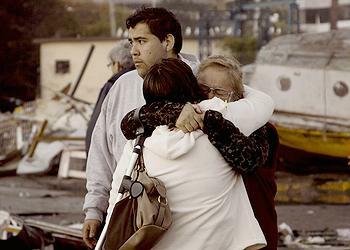 The first tsunami waves arrived on the Chilean coast within minutes of the quake. 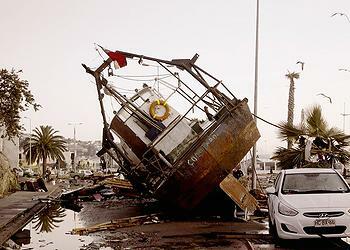 A wave 4.5 meters (15 ft) high was observed along the coast of Coquimbo and the cities of Coquimbo, Tongoy and Concón reported flooding; and fishing vessels were flung into the streets of Coquimbo, where there was heavy damage to commercial buildings and homes. In Tongoy, “large parts of the sea front” were destroyed. Across the region at least 500 buildings were destroyed, while dozens of beachfront homes in Los Vilos were damaged or destroyed. By Thursday afternoon the tsunami threat had passed without damage for most areas across the Pacific. In Hawaii, however, the Honolulu Department of Parks and Recreation kept some popular beaches closed Friday due to the possibility of hazardous currents following the 8.3 magnitude quake off the Chilean coast. “The evacuation of one million people ensured that there was no repetition of the loss of life which happened five years ago when 523 people died,” she said. Chilean authorities declared a state of emergency in Coquimbo on Thursday and deployed 3,400 troops to the region. Buildings swayed and car alarms sounded in Buenos Aires, Argentina, 1,110 kilometres (690 miles) away from the epicenter, and the quake was felt in São Paulo, Brazil, more than 2,600 kilometres (1,600 miles) away. Several aftershocks of magnitude more than 6.0, and 59 smaller shocks have rocked the quake-affected area. Richard Toro, director of the National Emergency Office of the Ministry of Interior and Public Security, ONEMI, said he expects the aftershocks to keep on coming. Illapel, an inland city of some 30,000 residents, immediately lost electricity or drinking water. Two days after the quake, about 90,000 people across the region were still without electricity. The Chilean government has sent bottled water, food, bedding, construction equipment, trucks and hygiene kits to the stricken area at the request of the regional government. Deputy Interior Secretary Mahmud Aleuy told reporters Friday that 100 percent of the air and ground transportation and 90 percent of basic services had been restored to the hardest hit Coquimbo region. Alejandro Molpeceres, the UN Resident Coordinator in Chile, said the country’s large investments in legislation, infrastructure, human capacity building and emergency planning had saved lives and property. While the loss of lives is “tragic,” the damage was “minimal if you compare with earthquakes of the same size in other countries,” said Molpeceres. Wahlström applauded the Chilean Government’s successful efforts to reduce disaster risk and minimize the number of casualties from the earthquake and tsunami. Chile is among the many disaster-prone countries that contributed to formulating the Sendai Framework for Disaster Risk Reduction, a global plan for reducing disaster losses adopted earlier this year at a UN conference held in the Japanese city of Sendai.